The popularity of raw treats these days doesn't just owe to the wholesome nourishment provided by raw healthy ingredients or to the simplicity of making goodies without having to cook. The fact is that raw treats are every bit as delicious — or even more so — than the baked delights we grew up with. It's quite amazing what you can do without flour, eggs, milk or a stove or oven. 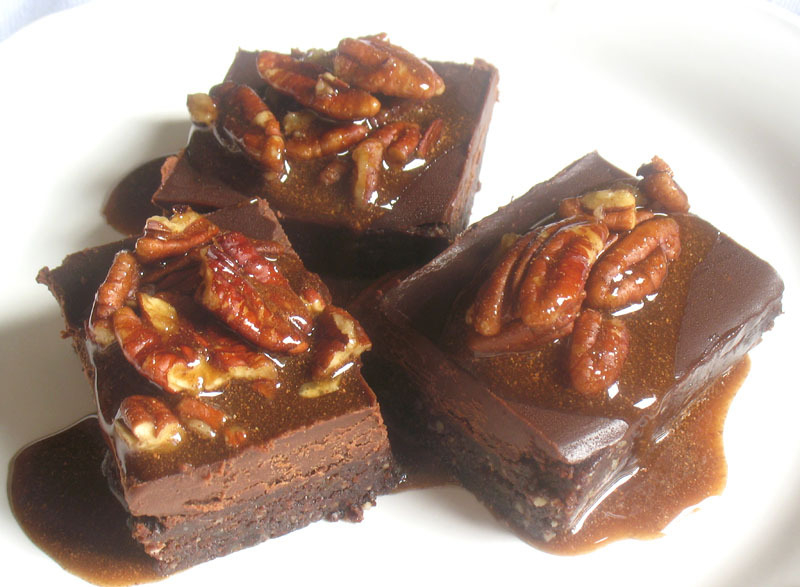 Take these raw cocoa brownies for example … so rich, fudgy and attractive that no one would ever guess that they didn't come out of a bakery. Or that they're packed with protein and fiber. 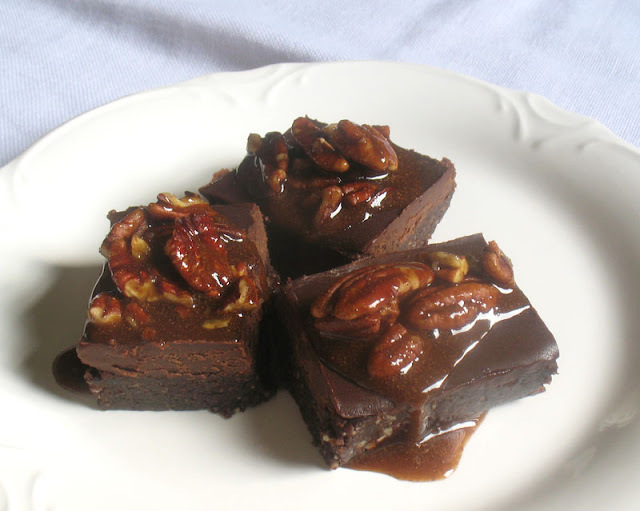 These no-cook brownies with warming spicy undertones of fresh ginger and cinnamon topped with a sweet maple syrup and nutty pecan smothering of goodness are every bit as decadent tasting as sugar-laden treats from a bakery, but without the guilt. Still they are very rich, and just one square will suffice most diners although the urge to eat more than one will be hard to resist! Note: Coconut butter is a smooth spread made from the flesh of coconuts, thicker and more coconut-tasting than coconut oil. You can make it yourself at home if you have the time and patience, but it is readily available in natural food stores and large grocers where you may find it under the name of coconut manna. For the brownies, grind the almonds in a food processor until they are reduced to a flour. Add the dates and raisins or prunes and process until well combined. Add the cocoa, pecans, vanilla, salt, fresh and ground ginger, and cinnamon. Process again until everything is thoroughly mixed. Line a 8 × 8 inch baking pan with parchment paper. Transfer the mixture to the pan and press down firmly. For the frosting, combine the water, coconut sugar, maple syrup, honey or agave, vanilla, coconut butter and coconut oil in a blender. Blend until smooth. Add the cocoa and blend again. Spread the frosting over the bottom layer of the brownies and chill until set — 4 to 6 hours. To make the topping before serving, combine the pecans, maple syrup, coconut sugar and cinnamon. 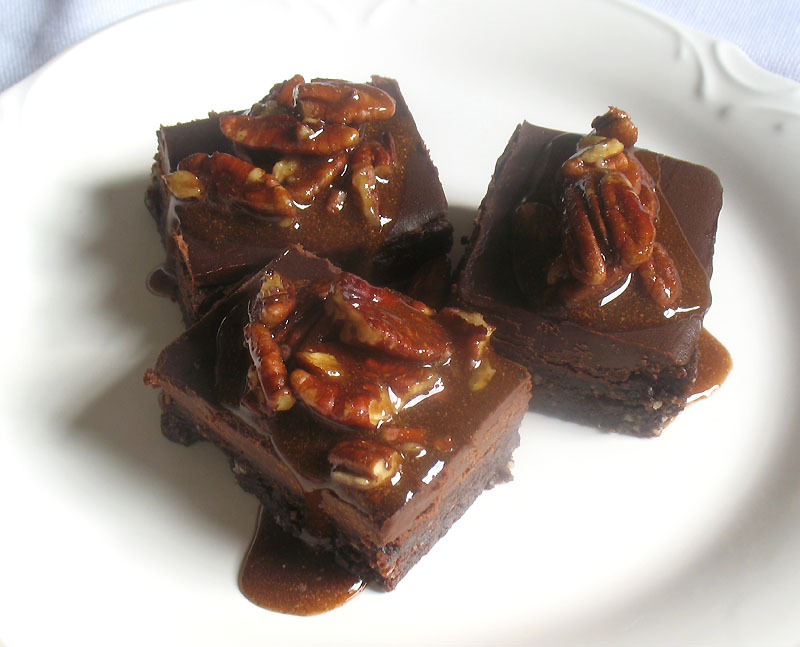 To serve, cut the brownies into small squares and top with some of the pecans.